← Catch the wave – it’s Rivers to Oceans Week! 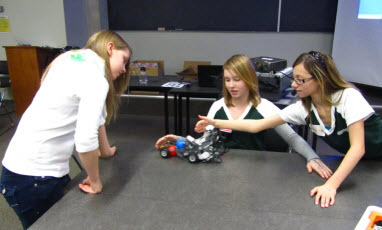 WISEST (Women in Scholarship, Engineering, Science & Technology) is an organization at the University of Alberta that develops and delivers outreach experiences designed to encourage and empower girls and women in science, engineering and technology. The BlazeIT camp that Casey has written about is part of IlluminateIT, a new initiative you can book online that’s aimed at showing girls how awesome Information Technology is. View the trailer for the program to get a better idea of how much fun we have! HI! My name is Casey Shunock and I am a member of the 6th Oriole Rangers from Edmonton Alberta. This January we participated in the pilot of a program called BlazeIT hosted at the University of Alberta by a program called WISEST (Women in Scholarship, Engineering, Science and Technology). It was a two day program jam-packed with fun. There was one Ranger unit and three Pathfinder units. On the first day we discussed I.T. (Information Technology), what it is, how it is important and most importantly that anyone can do it! We learned all sorts of things like how many careers depend on I.T. and how fun it can be. The most exciting part of the weekend was the Lego robots! We got divided into groups of three or four; in our groups we all took a role. The roles consisted of a mechanical engineer, biomedical engineer, UN ambassador and a computer engineer. 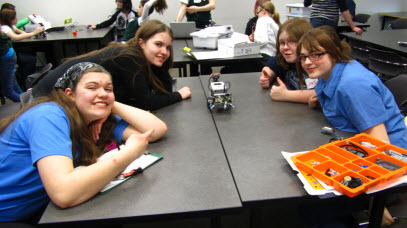 Our groups were to build a robot program it and then explain how a robot might be able to help with a Millennium Development Goal. Our team name was Megatron and our robot’s name was Kumquatbot!!! We finished off the first day with a talk about cyber bulling and the dangers social networking sites can have. But we also discussed how to prevent and deal with cyber bulling if it happens. Day two started with a panel including female members who work in the Information Technology field. They opened up our eyes to what different ways Information Technology can be used, that I.T. is not a male dominated field and they were all very successful. That afternoon we put our robots to the final test! 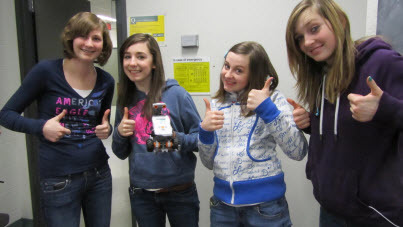 We programmed them to do a course and help save a Lego man named Jimmy. Also, we presented our ideas about the Millennium Development Goals. Overall this was a great weekend! Everyone had a blast and we still talk about how much fun we had! Another awesome aspect of the weekend was our wonderful program leader Jen!!! She did a great job with the weekend and provided us with great information about how geeks are the coolest! Have a comment about this post? Now it’s so easy. Just click on ‘Comments’ and use your Twitter or Facebook log in to share your thoughts. Or do so as a Guest! We’d love to hear from you!! 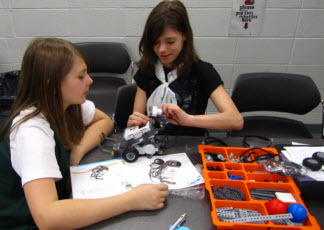 This entry was posted in Awesome Activities and tagged Information Technology, IT, STEM, UN MDGs. Bookmark the permalink. Margaret-Ann Armour, UAlberta’s Associate Dean, Diversity, is a strong supporter of this program. She is an inspirational person whom i have had the pleasure of meeting on numerous occasions. Her passion for women and girls in science, especially chemistry, is admirable. casey is my sister and i did not think it was that good but it is awesome!!!!!!!!!!!!!!!!!!!!!!!!!!!!!!!!!!!!!!!!!!!!!!!!!!!!!!!!!!!!!!!!!!!!!!!!!!!!! !